Five Points was so named because of five roads coming together. They were 2nd Street (east and west), Washington Ave. (north and south) and Harrisville Ave. coming in at an angle from Farr West and Plain City. 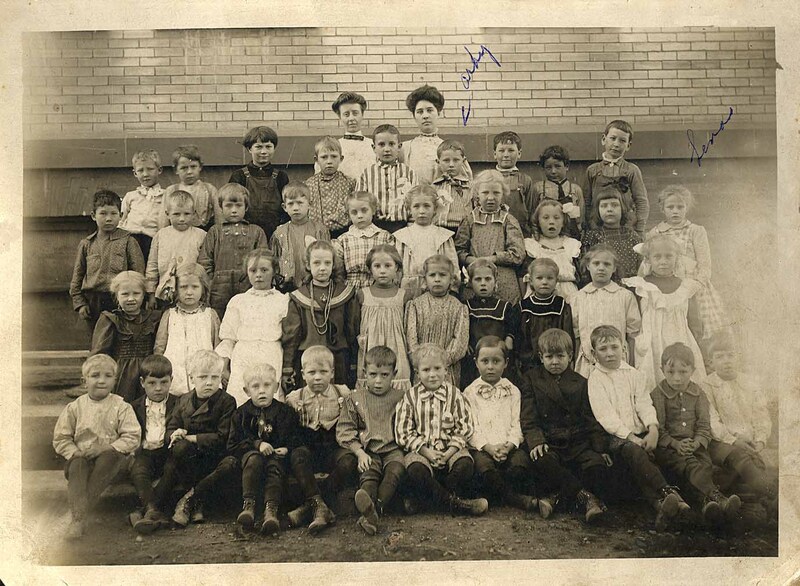 I started school in 1907. Arch Clapier with class at the Five Points School; photo c. 1907, courtesy Connie Clapier. Five Points had five saloons at that time. I remember boys like myself use to run down during noon hour and gather the beer and whisky bottles from back of the saloon and trade them to the grocery store for candy. That was our spending money. In 1907 Five Points had a bad reputation for being a tough place. The men would come out from Ogden to get drunk. We used to ride the streetcar for 5 cents. There were some good people with families living in five Points. They were hard working and good citizens. I’ll try to mention a few. John Randall’s family consisted of William, Edward, Nellie and Laurie. Harvey Randall had five daughters. They owned the Lumber and Coal Yard. Three generations of the Shaws ran the grocery store. The Redfields had an electric shop and bicycle shop. One of the boys built the first radio in Ogden. Fred Redfield had honey factory. LeVar moved to Reno and became a multi millionaire. Jim Harrop had a very large family of boys. He was the fire marshal for the volunteer fire department. The water was pumped by hand and they had regular fire drills once a month. I remember the Leavitts on Second had 4 boys and 2 girls. The Olsens had 2 boys and 3 girls. The Moroni Stones had 3 boys and 4 girls. The Price family had 3 boys and 4 girls. The Richards had 1 girl and 6 boys. The Sherners had 2 boys and 5 girls. The Christensons had 3 girls and 5 boys. The Bolanders had 3 girls and 5 boys. The Victor Renos had 1 boy and 5 girls. The John Hutchens had 5 boys and 2 girls. Maeros had 4 girls 4 boys. Clapiers had 7 girls 2 boys. The irrigation water was brought to Five Points in 1850. It was called the Lynn Irrigation Co. It was the 2nd water right on the Ogden River [actually the tenth]. The land north of 2nd Street was known as part of land grant given to Captain James Brown by Brigham Young for leading the Mormon Battalion. The land bought from John Hutchens [ by the Clapiers at 230 W. 2nd St.] was part of the land grant. The large brick house on the Reno farm was first a schoolhouse. There were 2 churches in Five Points, the Congregation where the Bank of Utah is now and the Mormon Church and the Mormons were known as the Lynne Ward. 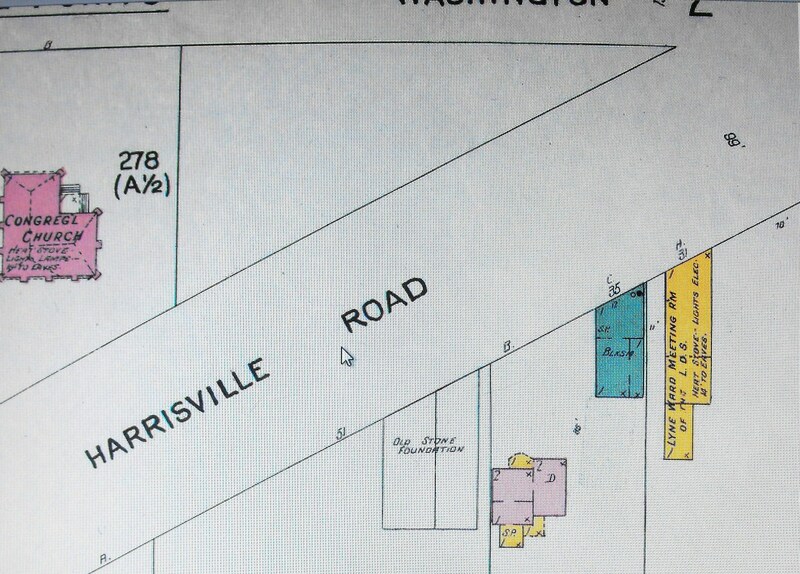 It was located near the blacksmith shop on Harrisville Ave.
Congregational Church, Lynne Ward Meetinghouse, and blacksmith shop 1906; Sanborn Fire Insurance Map. It was always exciting when the thrashers came into the neighborhood as I remember the thrashing machine was powered by horses ran by a man named Buck Bradshaw. The Jack family lived in house in rear of W.A. Shaw grocery store. They came from Scotland. Get information from Mrs. Owen Wangsgard; she was a Jack. This entry was posted on November 11, 2010 at 3:16 pm	and is filed under 5. LYNNE, WEST SIDE, a. Arch Clapier Reminiscent Memories. You can follow any responses to this entry through the RSS 2.0 feed. You can leave a response, or trackback from your own site.